The Beatles recorded "Love Me Do," the average house in America sold for $12,500, and gas was twenty- eight cents a gallon at a pump near you, where a squad of friendly men in smart uniforms rushed to wash the windows and check the oil the moment your car rolled to a stop. Yet despite the good times, a crisis was in the air. No, not the Cuban Missile Crisis. The Great Ham Crisis. Sure, there was plenty of good ham. Indeed, merely adequate ham was available almost everywhere.But where was the great ham, the ham that instantly started your mouth watering, that was not too salty or too dry, that turned any holiday table into an instant classic? Enter Pepper Martin, a mild-mannered grocer from Cincinnati, who moved to Helena, Montana that year and opened an IGA. With him came a treasured family recipe for creating the tenderest, most delicious, most succulent ham anybody had ever tasted. They even graced the White House dining room, where Presidents Nixon, Carter, and Reagan all are rumored to have asked for seconds. Naturally, folks in Helena took notice, and as the years passed the legend grew. If you wanted the best ham -period- for Thanksgiving, Christmas, or Easter, it had to be "one of those hams from the IGA." Today, a Montana Valley Ham (we thought it was a better name than "one of those hams from the IGA") is still the last word in tender, juicy, perfect ham. 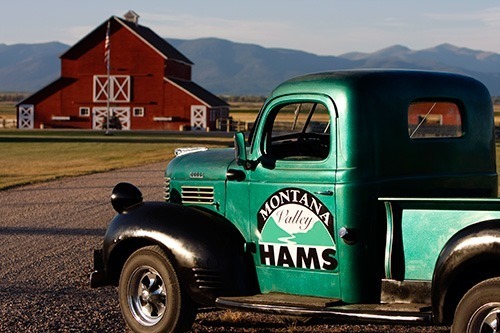 Over the years, our hams have found their way to a surprising number of tables, and not just in Montana, either.Sent aswonderfulgifts to family members not lucky enough to live here, Montana Valley Hams have spread the message of perfect ham far and wide. The best part of the Legend of Montana Valley Hams is that they're not just a legend. They're real, and the fact that you're reading this probably means you're about to find out if the legend is true. To that we say, "Enjoy."